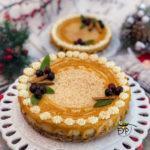 Instant Pot recipe for egg-less Pumpkin Spice Cheesecake made with Greek yogurt instead of cream cheese and enhanced with butterscotch ganache to bring out the maximum Oomph….! 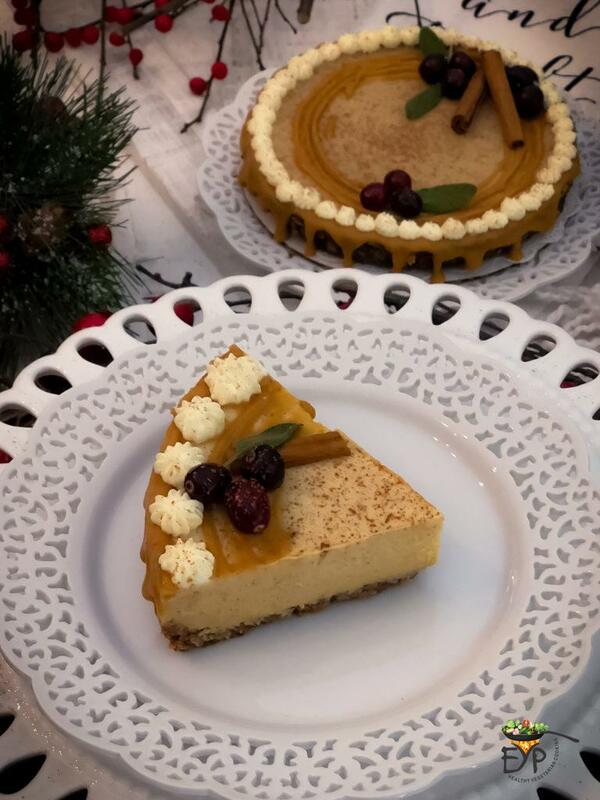 of this holiday season dessert. 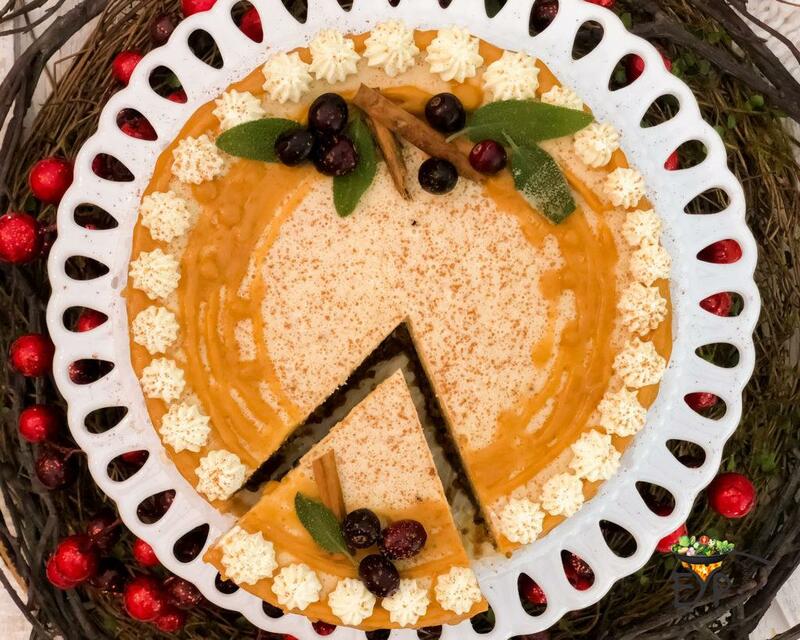 It is hard to let the holiday season pass, without baking or making a pumpkin dessert. 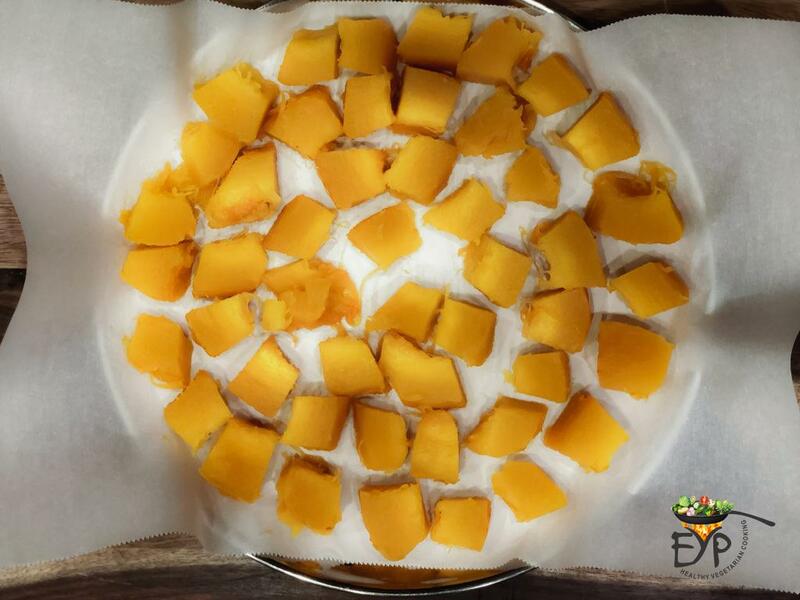 I always strive to make conventional desserts in a healthy manner by modifying ingredients and cooking methods. 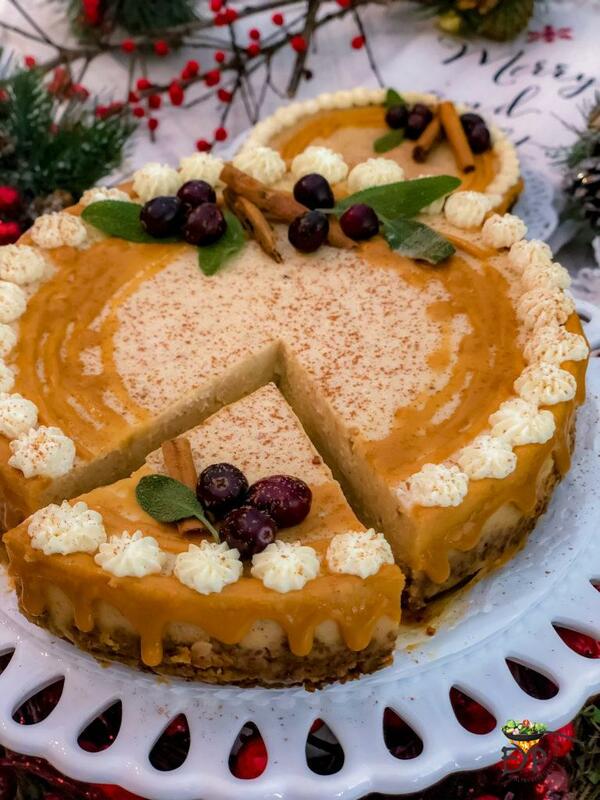 In this pumpkin spice cheesecake recipe, since I do not use the cream cheese, it makes it much lighter on stomach and you can eat as many pieces as you like without feeling heavy. 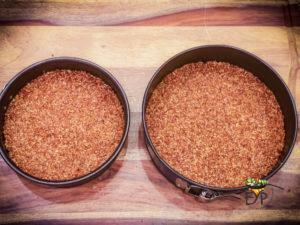 The crust recipe used here can also be used for making energy bites without any added sugar and butter. I am probably one of the very few folks in the America, who are not a huge fan of cheesecake. However, the ease of making them and popularity has always kept me interested in exploring this dessert further. I am a huge fan of pumpkin spice though and always go for pumpkin spice latte when available at any cafe. Hence, what better combination than egg-less Pumpkin Spice Cheesecake made with Greek yogurt instead of cream cheese could be? 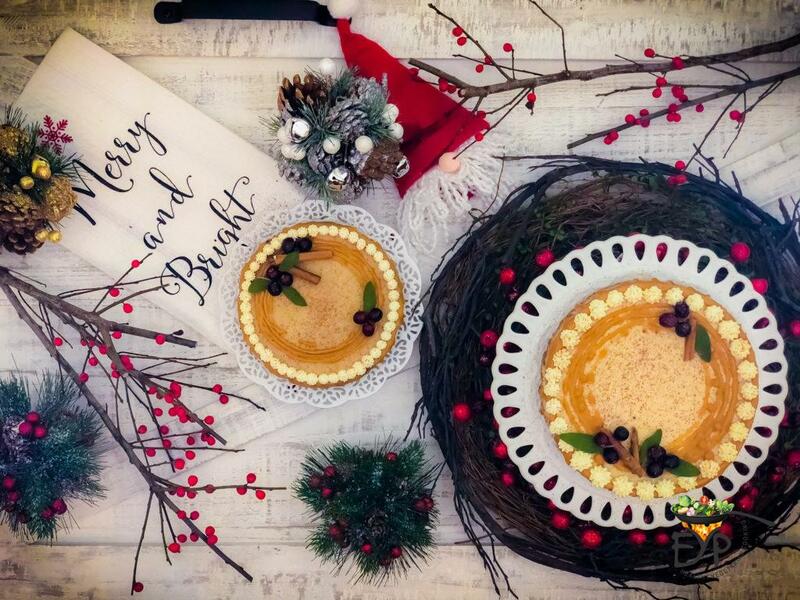 I first came across the idea of baked yogurt desserts, when an Indian Master Chef finalist made the popular Indian Bengali recipe of Bhapa Doi / Misthi Doi for the grand finale many years back. 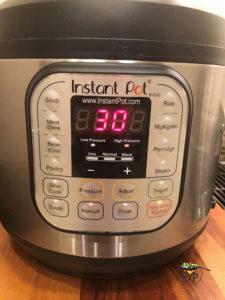 Since then I have been experimenting in my kitchen, however this is the first baked yogurt recipe on my blog using Instant Pot. Large number of vegetarians around the world donot eat any eggs. Eggless recipes make it especially attractive for them. 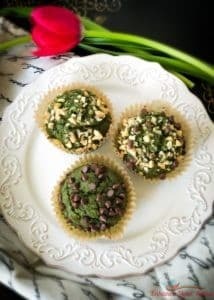 If you are using this recipe for an event, then you don’t have to worry about dietary restrictions. 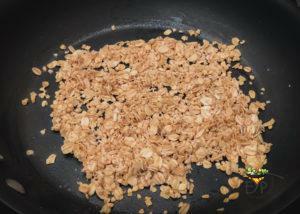 This recipe is gluten-free, wheat-free, soy-free and eggless. 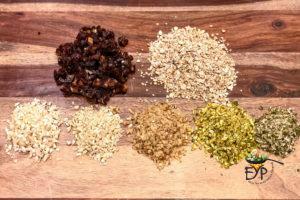 You can alter the use of nuts, if needed for nut allergies. Butterscotch ganache takes the flavors of this recipe to another level. It is indeed very simple to make using the butterscotch chips readily available in the baking aisle of any grocery store. So how do you know that this recipe is the best? My husband took this cake for his work colleagues as a holiday dessert it did not last long. 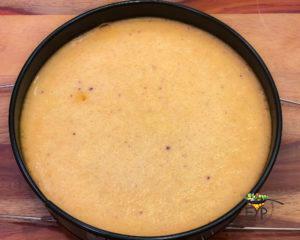 Several folks approached him asking where he got it from and why is this cake so light, less sweeter than other cheese cakes and amazingly delicious at the same time. When he shared that news with me, it made all the effort worth it! 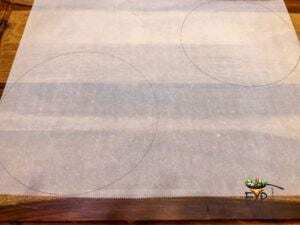 Add one cup water on the bottom of the Instant Pot liner don’t forget to put the trivet first. 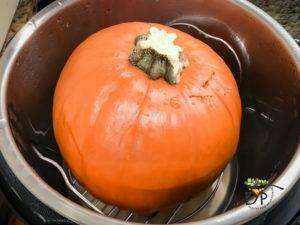 Now place the Sugar Pumpkin on the trivet. Close the lid, turn the vent to sealing position and pressure cook for 6 minutes. Let the pressure release naturally. When the pressure pin drops down open the lid and take out the trivet along with pumpkin and let it cool down for 15-20 minutes. Flip the half and peel it using a utility knife. 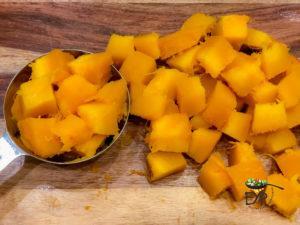 Now cubed the clean and peeled pumpkin. 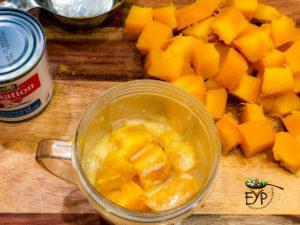 Takeout a cup of cubed chunks and freeze the rest for later use. 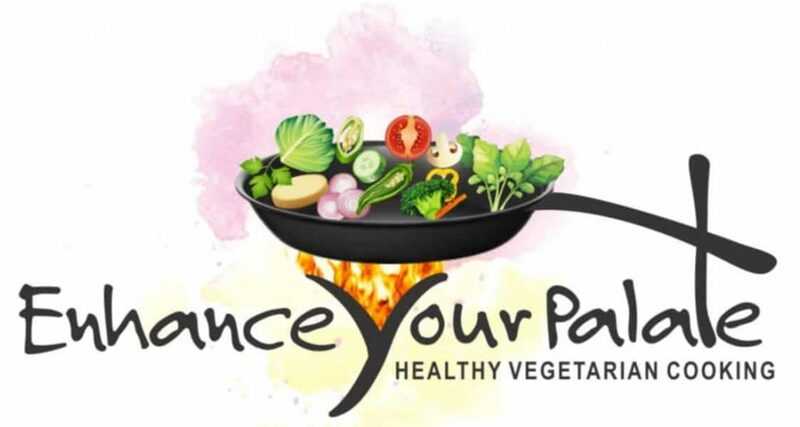 Prepare a 7inch springform pan by coating it with a non-stick spray and then lining the bottom with parchment round. 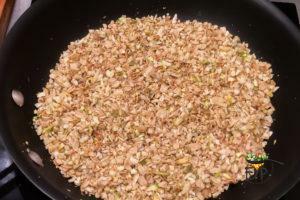 In a pan heat oil then roast oats and roughly chopped nuts for few minutes on medium heat. Then in food processor, pulse together roasted oats and nuts mixture, chopped dates and pumpkin spice few times until everything mix thoroughly or to your preferred consistency. 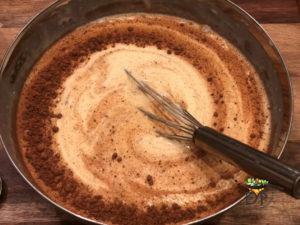 Pour this mixture in the springform pan and press evenly in the bottom of the pan to form an even layer. 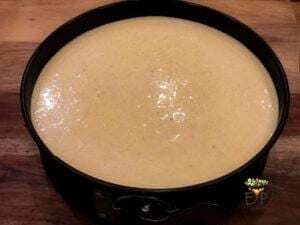 Place the pan in the freezer for at least 10 minutes or until filling is ready to pour. 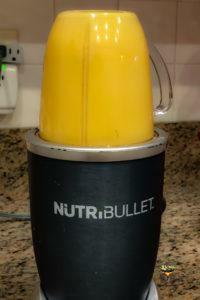 Now add blend heavy cream and boiled pumpkin chunks and puree in a blender until smooth. And pumpkin spice until everything is incorporated nicely. Pour this mixture over the prepared springform pans. 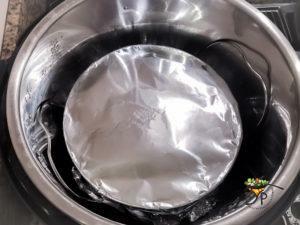 Cover the filled springform pan with aluminum foil and place the springform pan on the trivet comes with Instant Pot. Pour 1 cup of water into the Instant pot, and then lower the trivet with covered springform in the bottom of the pot. Lock the lid in place. Select High Pressure and set the timer for 30 minutes. When pressure cooking is done, let the pressure release naturally. When pressure pin drops carefully remove the lid. 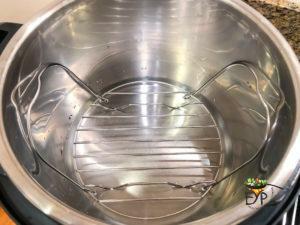 Remove the springform pan from Instant Pot, place on a wire rack to cool for about 30 minutes. When cheesecake is cooled, refrigerate covered with plastic wrap for at least 6 hours or overnight. Take out the springform pan from refrigerator, run a knife around the edges of the cheesecake, this will help releasing the cheesecake from the pan. Carefully, open the hook and remove the pan. 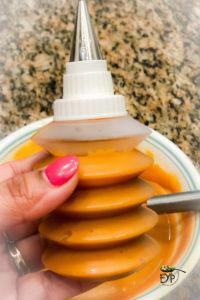 Heat the cream and then pour over the butterscotch chips. Stir until all the chips are melted uniformly. To make whipped cream icing make sure your mixing bowl, whisk is chilled and chilled bowl is placed it on another bowl full of ice. 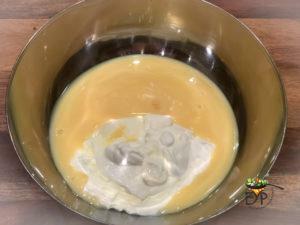 Pour the heavy cream into the chilled bowl. Start whipping first on medium high speed until the cream starts to thicken. Slowly add the powdered sugar and continue whipping on high speed until stiff peaks form. 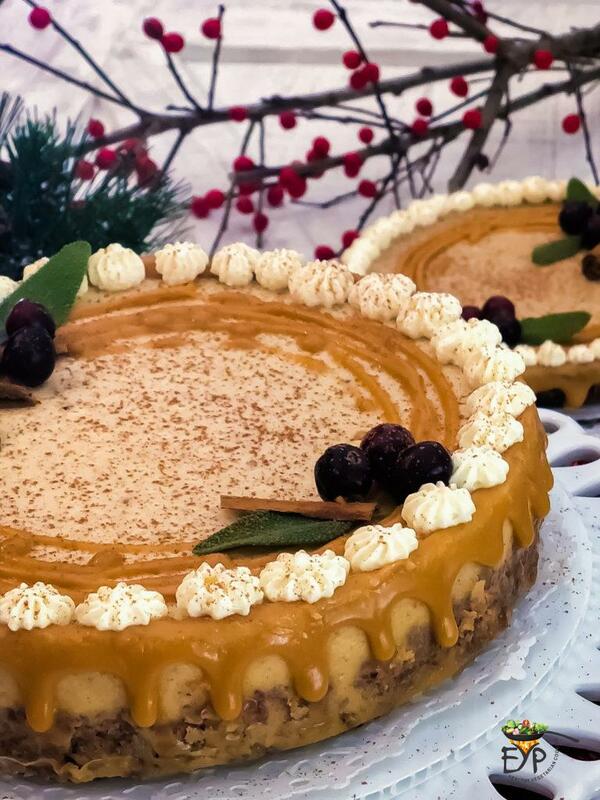 Top it with some butterscotch ganache and heavy whipped cream icing before serving to bring out the extra oomph of this pumpkin spice cheesecake. If you store it properly in a refrigerator then this cake should be good for up to a week for anytime dessert. As the time will pass the flavors will become more bold. Hence, your last bite will be the best bite of this dessert. Please leave a comment or feedback, if you try it. 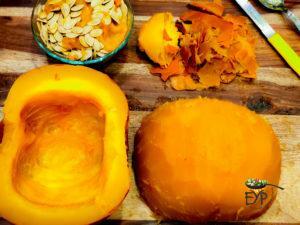 Now cubed the clean and peeled pumpkin. 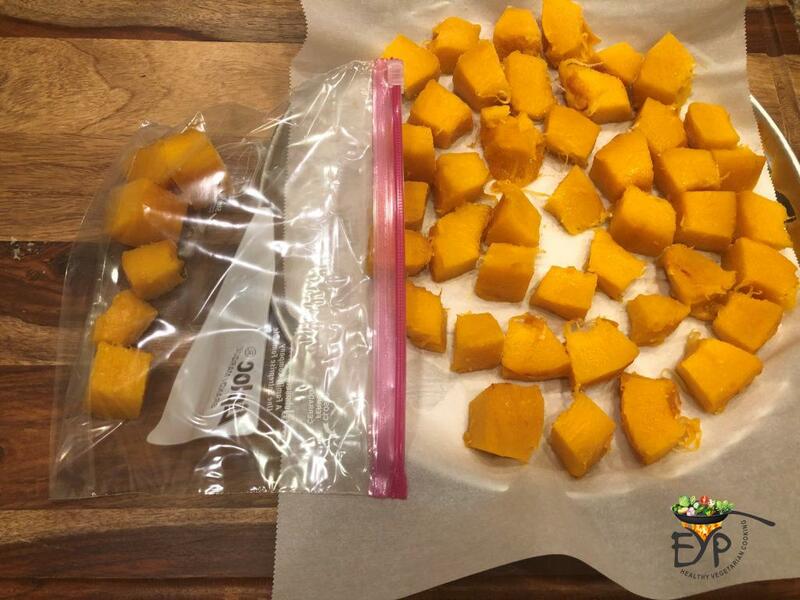 Takeout a cup of cubed chunks and freeze the rest for later use. 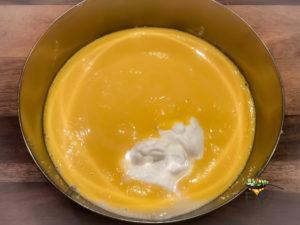 To prepare filling in a large mixing bowl, mix strained yogurt, condensed milk, pumpkin puree and pumpkin spice until everything is incorporated nicely. 10. Pour 1 cup of water into the Instant pot, and then lower the trivet with covered springform in the bottom of the pot. 11. Lock the lid in place. Select High Pressure and set the timer for 30 minutes. 12. 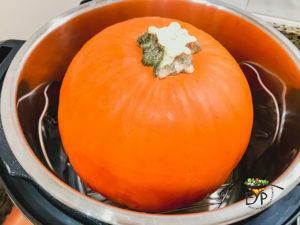 When pressure cooking is done, let the pressure release naturally. When pressure pin drops carefully remove the lid. 13. 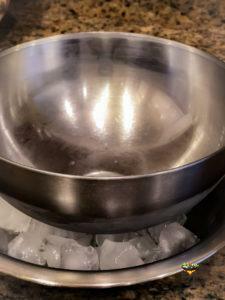 Remove the springform pan from Instant Pot, place on a wire rack to cool for about 30 minutes. When cheesecake is cooled, refrigerate covered with plastic wrap for at least 6 hours or overnight. 14. Take out the springform pan from refrigerator, run a knife around the edges of the cheesecake, this will help releasing the cheesecake from the pan. 15. Carefully, open the hook and remove the pan. 16. 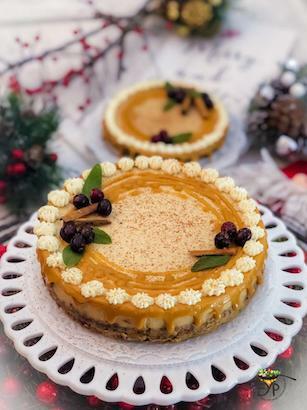 Top with some butterscotch ganache, heavy whipped cream icing to enjoy the extra oomph of this pumpkin spice cheesecake. 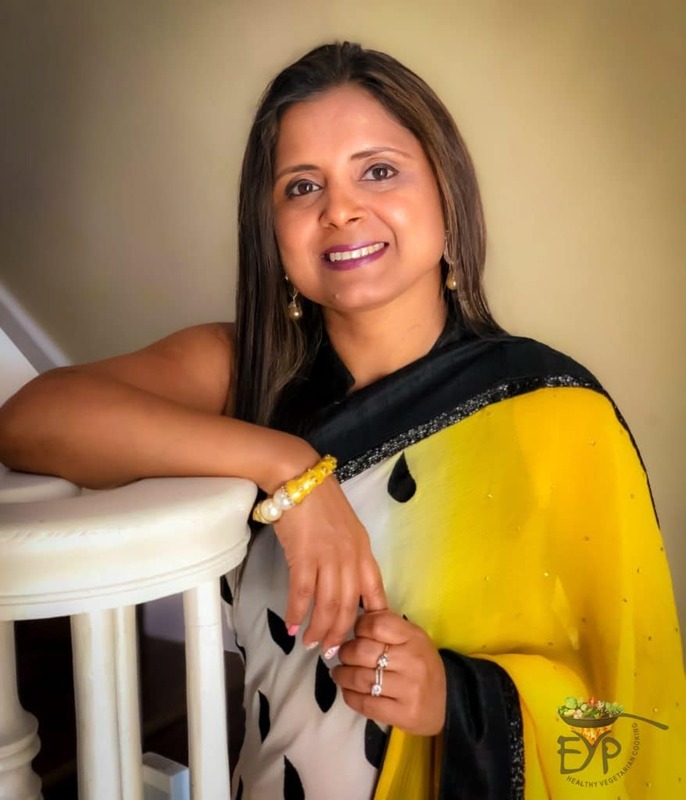 Hi Rupali, how do you strain greek yougurt and for how long? How much of it do you need to get 1 cup at the end? 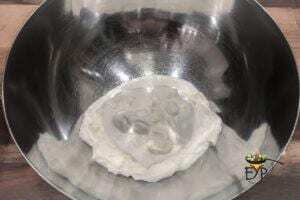 To strain yogurt set a fine sieve lined with cheesecloth or a coffee filter over a bowl and spoon the yogurt into the sieve. Refrigerate and allow the liquid to drain off for 12 hrs or overnight. 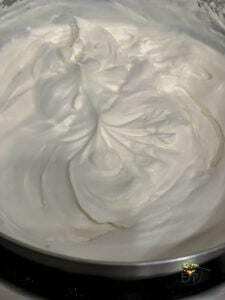 One cup of yogurt yields about 1/2 cup of thick strained cream cheese sought of textured yogurt. So for 1 cup of strained thick yogurt you would need two cups of regular yogurt.